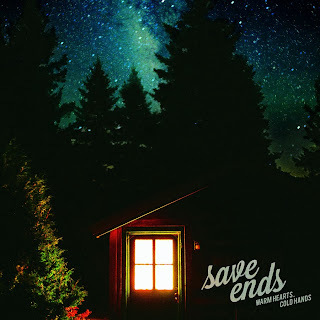 Atlas and the Anchor: Save Ends - "Warm Hearts, Cold Hands"
Save Ends - "Warm Hearts, Cold Hands"
The Boston-based five-piece Save Ends are set to release their long-awaited debut album, Warm Hearts, Cold Hands this week via Tiny Engines Records. With the success of their two EPs released in 2010 and 2012, the band led by the male/female vocal interplay of Brendan Cahill and Christine Atturio, creates instantly memorable and nostalgia-inducing melodies bolstered by surging, 90’s emo-tinged indie rock in the same vein as The Anniversary, Rilo Kiley and Rainer Maria. The new album was recorded by Jay Maas of Defeater who has also produced for other likeminded bands such as Title Fight and Transit. The album opens with “PunkORama 30” that slowly builds into a euphoric and cathartic rush that follows into “We Are The Only Ones” with its driving rhythm and dueling male/female vocals that drip with passion. Standout track “A Life They Wrote” is highlighted by a head-nodding half-time beat and Christine’s bittersweet vocals. With clever lyrical references to Stephen King novels and Dungeons & Dragons, Save Ends makes emo for the nerd in all of us. Another standout track, “Song Of Susannah” is an anthem with chugging guitars and a punchy pop-punk intensity that is impossibly energetic and catchy. For the first pressing, Tiny Engines will issue Warm Hearts, Cold Hands on the following colorways: 105 Blue w/ White + Green Starburst, 130 Transparent Fiery Orange, 150 Transparent Light Blue and 215 Opaque Gray. Also, the digital download of the album is only $5 via the Tiny Engines Bandcamp page. Get yours now!